Kevin Duffy recently released the second edition of his book, Harvesting Nature’s Bounty. For those of you who may own the first edition there is plenty of reason to consider obtaining this edition. As a wild food educator myself I can certainly attest to how our knowledge continuous grows in this field because there are thousands of wild plants out there so learning is an ongoing process. Also, there are many universities nowadays (mostly overseas) that are seriously looking at wild plants as a food source so the valuable information researchers are discovering enhances the knowledge that we wild food educators have. This is why Kevin Duffy came out with a second edition – he has learned much more information and has added this knowledge to this current edition. The first thing that I found striking was that this 296-page book is divided into appropriate sections such as the seasons, location, culinary substitutes (i.e., thickeners) and he also includes some processes that are required with certain foods. 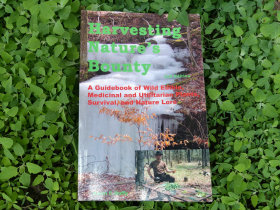 The bonus is that this is not just a book about wild edibles; it includes great information about wilderness medicine. Health ailments such as bacterial infections, headaches, constipation are addressed as well as how to effectively deal with burns, cuts, spider bites and much more. There are more than 100 photographs with over 200 edible and medicinal plants are discussed. If you’re into learning survival skills or prepping that goes beyond wild food then Harvesting Nature’s Bounty has something for you as well. In fact, what Kevin writes about is something we all should have some basic knowledge about because one never knows what the future holds. We are all vulnerable to the forces of nature no matter where we live so having survival skills is critical should disaster strikes. Climate change is here to stay for quite some time and this means trouble. Kevin offers great tips on nature’s toiletries, tools, shelters, fire starting, bare hands hunting techniques, weather predictors and much more. Whether you consider yourself a beginner or an intermediate in this field of study, you’ll find that there is a wealth of information in this book that covers wild edibles, utilitarian plants, survival, and medicine. This is a worthwhile book to have in your library. To order your copy, click here. Kevin Duffy grew up in southern Indiana and has a BS from Purdue University in biology. His education on wild plants started when he was young and he gained knowledge over the years. He continued learning about wild edibles when he joined the navy and later attended several wilderness schools. Today he teaches others about wild edible plants and a variety of survival techniques in southern Indiana and Louisville, Kentucky.